Fenner Dunlop Americas manufactures hydraulic belts for mines such as this one. Coal mining has taken a nosedive in the U.S. in the last year, and it doesn't look as if it will bounce back soon. That's the bad news for heavy conveyor belt makers, mining tire producers and their suppliers. The good news is that other sectors—including oil and gas—are doing well. Some manufacturers and suppliers blame aging mines for coal's woes. And that is a key factor. But many cite more stringent federal government regulations as the top reason, with growing production costs, a drop in coal prices and extremely poor weather conditions last winter as other culprits. 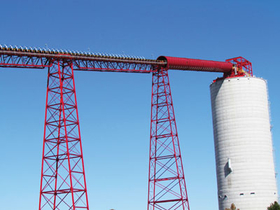 Recently enacted and proposed U.S. federal regulations are a major part of the problem, said Tom Richardson, president of Burr Ridge, Ill.-based Conveyor Accessories Inc., and officials at other firms. “Frankly, the current impact on mining is important and is quite serious to the infrastructure of our power system,” Richardson said. Without coal, “the industrial and consumer base is in the process of getting pounded by their electrical rates this summer,” he said. “The coal mining industry has really been impacted since this administration took over,” Richardson said. Mines are closing, he said, and aren't being replaced. “A miner loses his or her job, a small community becomes shattered, suppliers must shrink in size ... but the entire population is going to bear the brunt of the folly” to push green initiatives. Officials at London-based Fenner P.L.C., parent of global belting manufacturer Fenner Dunlop Americas, said recently trading conditions in the U.S. coal industry are deteriorating and aren't likely to improve soon. For most North American conveyor belt makers, the primary mining segments served are coal, copper and iron ore, according to Jim Hill, general manager for industrial products in North America at Fairlawn, Ohio-based Veyance Technologies Inc., a large producer of belting for the North American market. “All three have been impacted in a variety of ways. Competitive dynamics in the marketplace have allowed Veyance to maintain steady production levels at its plants, he said, but overall demand for belts used in coal mining is lower today than it has been for the last two years. In the final quarter of 2013, AirBoss of America Corp. blamed weakness in the coal mining market as the primary reason its rubber compounding division sales were off by $6.4 million, although its overall revenues—boosted by the purchase of Flexible Products Co.—rose 29 percent to $70.3 million. It mixes large amounts of compound for belt manufacturers. “Right now it's tough sledding for coal,” AirBoss President Timothy Toppen said. “But mining is a big part of our business and will continue to be a b+ig part.” However, the company has been diversifying during the last year and because of that, the impact of the poor mining industry may not be as big in the future as it would have been in the past. Fenner warned that its conveyor belt business is expecting weaker results than previously forecast because of a decline of confidence in the U.S. coal industry and an unsuccessful bid to snare a contract for supply of conveyor belts to an iron ore mining firm in western Australia. Fenner said the company's profit before taxes could be reduced by 10-15 percent from earlier estimates of about $105 million because of the poor mining situation. Mining firms are maintaining supply discipline, she said, suggesting that their coal is worth more in the ground than the value currently placed on it in the market. Underground coal production in Appalachia, where aging mines result in higher production costs, has decreased, Pan said, while above-ground operators in the Power River Basin in Illinois—with lower costs and highly productive operations—are gaining ground. Fenner has a large base in the global belt market, which has helped offset some of the downturn in the U.S. “Our Australian business has performed well and is seeing improving demand for its products, assisted by continued high levels of iron ore and coal extraction, which is being reflected in higher order books,” Pan said. She said the coal industries in India and China are going through structural changes. Coal mining is growing in India, although at a slower clip than previously projected, she said, while excess supply and falling coal prices have characterized China's coal market, leading to many mine closures. Fenner Dunlop's business in Chile, where the focus is on copper, performed well and has continued to develop. “We see considerable potential for the region in the future, Pan said. Global events and trends impact copper and iron ore, Hill said. Both segments have been level, but demand has lessened because of China's slower growth rate of late. The biggest impacts Ram has faced thus far are a reduction in capital projects and pressures to lower its rates, he said. A material handling specialist that provides a number of services and products to the mining industry, Ram's approach to the downturn has been to offer discounts for increased volume of service work. Coping with the downturn has required some creativity on the part of some large belting companies and some suppliers. Since the beginning of 2014, Veyance's backlogs have been reduced and the company has adjusted its lead times accordingly, Hill said. But he added that the firm has not had to make any significant changes to its plants or inventory position in reaction the market dynamics. In terms of a light at the end of a long tunnel, Hill said the market gradually should improve as 2014 progresses and as used belting in the coal industry becomes less prevalent.